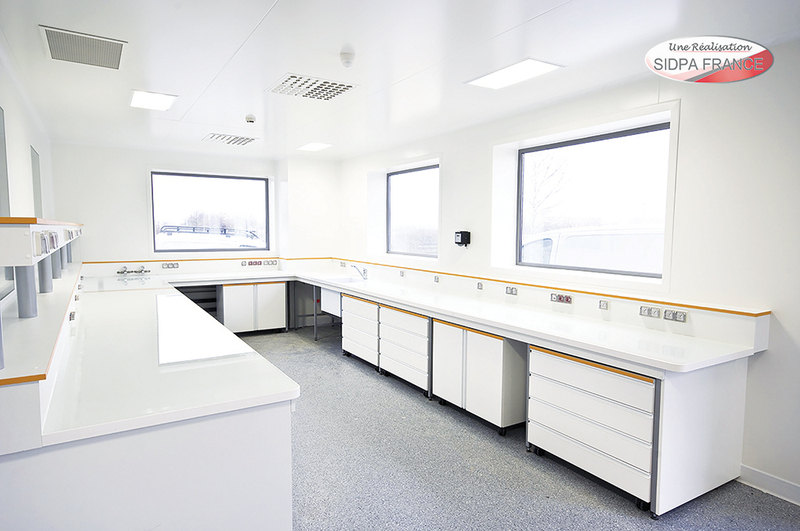 With 25 years of experience in the field, we fit our workbenches to suit the layout of your laboratory and your premises to the very highest standards, thanks to our qualified fitters. SIDPA France draws up an estimate corresponding to your specifications and advises you on the choice of materials. – One back crosspiece at the bottom, that rests against furniture, where applicable. Degreasing and polyurethane protective paint in 6 basic colours from the RAL colour chart. On the back of the worktop, a 140mm high splashback in 19mm thick water-repellent white melamine with white PVC edge for installation of electrical sockets or remote controls. Back panel or box, fixed on the wall behind the worktop, in 19mm thick water-repellent white melamine, 180mm high, for installation of electrical sockets or fluids. In 19mm thick water-repellent white melamine, fitted above the back panel. The shelf is 70 or 190mm wide depending on the type of workbench and is fixed with invisible brackets and PVC edging. Colours can be chosen from the RAL colour range.